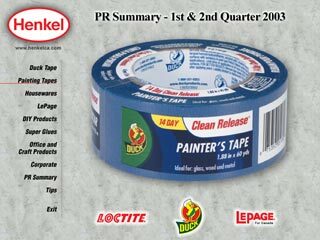 Henkel Consumer Adhesives needed an efficient way for their salespeople to leverage the massive amounts of public relations material generated throughout the year. We designed a CD-ROM that gives sales reps instant access to any one of the thousands of newspaper clippings, television commercials, radio spots, magazine articles, or internet news stories relating to all aspects of HCA's business units. The CD-ROM was a huge hit with the HCA staff and has recently been expanded to a two-disc set. 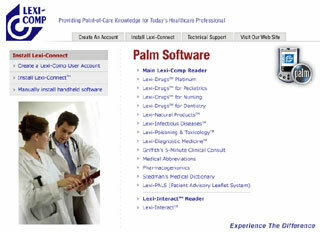 Lexi-Comp Inc. was looking for a cost-effective way to deliver their Palm and Pocket PC software products to their customers. They also wanted to provide links to tech support and provide users with a tutorial on how to install the software and establish their user account. We worked very closely with the staff at Lexi-Comp to design a user-friendly CD-ROM that performed so flawlessly, that Lexi-Comp built client-specific versions for their large corporate customers. We also created a web-optimized version that Lexi-Comp offers as a download on their website to assist online users with the software install process. 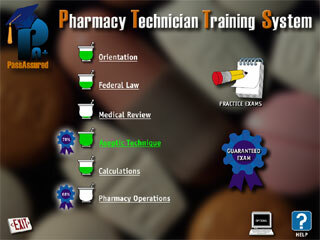 The Pharmacy Training and Testing disc we produced for Pass Assured, LLC. has set the bar for interactive learning on CD-ROM. Not only does this CD effectively train Pharmacy Technician students to pass their certification exams, it also was designed to be flexible and cost-effective for Pass Assured. We gave Pass Assured the ability to update every aspect of the presentation using simple database tools. This allows the disc to be as up-to-date as possible, while continuing to deliver the information to each student in a self-paced manner. 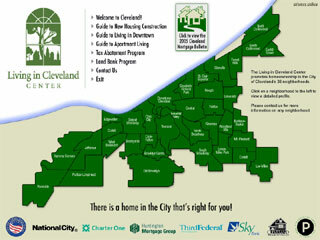 The Living in Cleveland Center is a non-profit organization whose goal is to entice prospective home buyers into moving into a Cleveland neighborhood. Now in it's 3rd edition, the Living in Cleveland CD-ROM has replaced bulky and expensive print brochures with an interactive guide to Cleveland's many fine neighborhoods. Users can view images of typical housing found within the various locations, view points of interest, and even print out a copy of the information. Living in Cleveland also included electronic versions of many of the guides they offer such as The Guide to Apartment Living, The Guide to New Housing Construction, The Guide to Tax Abatement, etc., saving thousands of dollars every year on printing and mailing. Royal Appliance manufactures multiple lines of high-quality vacuum cleaners under the Royal and Dirt Devil brand names. In the past, dealers were issued a catalog with schematics, wiring diagrams, and parts and price listings. We worked closely with Royal Appliance to create the Interactive Service Manual that allows dealers to search for parts by model or part number, view schematics and click on individual parts, and generate lists of products and prices. 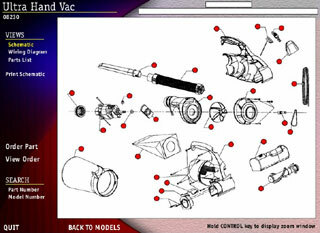 The Interactive Service Manual proved immensely popular among Royal's repair centers. Royal also realized a savings in printing and mailing costs with the new CD-ROM application. 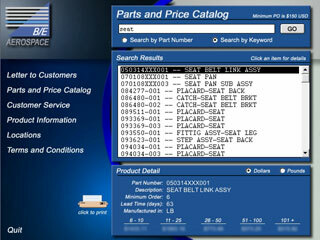 B/E Aerospace needed to replace their outdated, in-house version of their CD-ROM catalog. The design was tired, the interface was difficult to use, and it was very time consuming and expensive to update every year. We developed a new CD-ROM catalog for B/E Aerospace that was very user-friendly and was simple and inexpensive for them to update. The CD featured a searchable catalog, with pricing in dollars and pounds, and allowed the user to print out information about each product. As a growing company, the Fibromyalgia and Fatigue Centers need an inexpensive yet effective way to deliver their message to potential patients around the country. We developed a CD-ROM for FFC that delivered their message and also answered many of their patient's questions regarding the disease. We also produced a short video for the CD that gave the patient a virtual walk-through of their flagship location in Dallas, Texas. 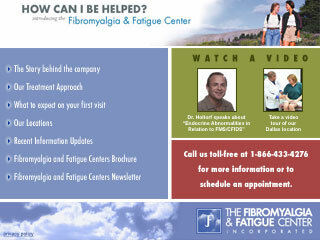 Fibromyalgia and Fatigue Centers also uses the disc to communicate with potential investors and franchise buyers. 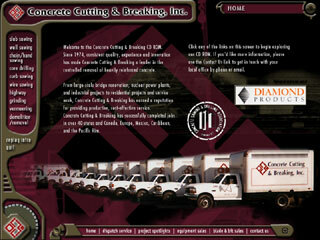 When exhibiting at trade shows or calling on customers, Concrete Cutting and Breaking needed something that would set them apart from the competition. We developed a "cutting edge" CD-ROM that was not only entertaining and packed with information, but also took advantage of custom-cut CD technology. The disc itself resembled a diamond-edged saw blade. We put the disc in an ultra-clear vinyl sleeve which, when given to a customer always received a "wow" and, more importantly, a phone call.